It’s believed that people are very familiar with the lawn lamp. After all, it can be easily seen outdoors in daily life. 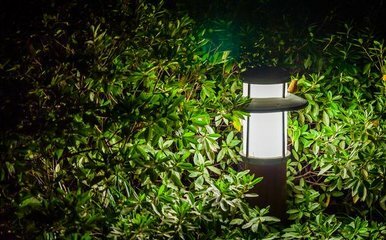 In particular, modern people like to walk at night, during which they will see the lawn lamps in the park and have the same feeling that the lawn lamp is very bright and completely different from the ordinary lamps. So, how much is the power of lawn lamp to meet the lighting need? Many people are curious about the answer. In fact, most of the existing lawn lights use LED as the light source because of its long service life, which will be fine even working for thousands of hours. Moreover, the LED lamp has low requirement for the voltage, so it is very suitable for the solar lawn lamp. Actually, there is no certain requirement for the power of the lawn lamp, and the power of many lawn lamps is different. Some special environment requires high power of lawn lamps, while other places don’t. It can be said that the power of the lawn lamp mainly depends on its working environment. The most proper way is to select the power of lawn lamp according to the place where it is used. Also, since the service life of the lawn lamp is very long, you don’t need to worry about the replacement after installing it on the lawn. Therefore, the power of lawn lamp is decided by the specific place to be used. Basically, the illumination of lighting fixtures installed on lawns is satisfactory.